No matter if you’re a lifetime sport fisher or someone for whom fishing is a relaxing hobby, the opportunities which arise when you combine kayaking and fishing are exciting. Once you’ve moved on to fishing from a boat, it’s only a question of time when you’ll be ready for a new kayak adventure. Kayaks are very versatile, and it’s getting down the basics of paddling is pretty simple, which makes for a great opportunity for beginners. There is no age barrier, and the sport itself is extremely healthy, so I recommend it for every fisherman out there. It adds a bit of spice to the regular fishing routine. You will first need to choose a suitable kayak for your needs. You will need to consider: stability, comfort, transportation, and storage. A lot of the stores will let you rent the kayak you’re interested it so that you can test it out. You can also choose to buy a second-hand kayak. Whatever your choice is, it’s always a good idea to customize your boat, so it best fits you. 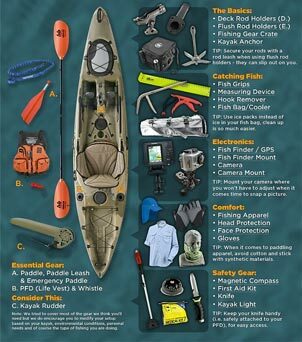 To make your kayak suitable for fishing ensure that you have a comfortable backrest, a paddle leash, and holder, kayak fishing pole holder, an anchor, a cooler and storage space. Be aware of the storage space available for tackle and gear. A kayak will be a backup drag system for your real because a strong 6 or 8 lb fish can pull your kayak around. Tight drag or slow reactions mean that the fish will have a harder time to break the line in open water. If your tackle is light, you will need to increase line capacity so that longer runs are possible. A good way of handling the fish is to release them, but always make sure the fish is fully resuscitated before the release. The fish you’re planning to keep will need some storage space. Smaller fish can fit in a cooler with ice or a fish bag with ice, and you can wrap bigger fish in towels and strap it to the kayak. 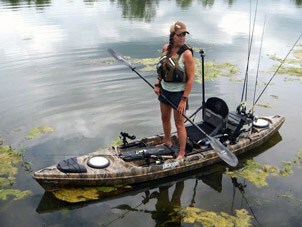 Keep in mind that the best kayak for fishing is the one customized to your personal needs and style. 1) PDF (personal floatation device): make it as comfortable as you can, as you will be wearing it for most of the day. 2) Paddle: this one seems a bit obvious, but it’s good to mention that you won’t be able to move that kayak around without it. 5) First Aid Kit: no matter how little storage room you have, this is a must-bring. 6) Waterproof Storage: it’s useful to have a safe place for a phone or keys. Try using a dry-bag if all else fails. 7) Food and water: for prolonged trips make sure you bring enough water with you. You might be surrounded by water, but it’s the wrong type of water. The beginning of doing any sport is challenging, but I’m sure you will be an expert kayak fisherman in no time. Tight lines!